“Thy Mind, O Man,” photograph of original manuscript. The Joseph Smith Papers. So I thought that I would start a new website at ThyMindOMan.com to better capture this new approach to the subject—exploring the mind’s relationship to God. I will explore how we might be able to use our mind and consciousness to explore those heights and depths that Joseph referred to, and to commune with and ultimately become one with God, something Joseph said we must do. And I want to share my thoughts with you. Thank you for your dear friendship and conversations that we’ve had on TempleStudy.com. It’s been a truly remarkable decade. 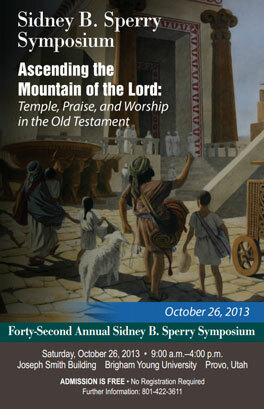 The 42nd Annual Sidney B. Sperry Symposium this year will be focused on the topic of the temple, specifically “Ascending the Mountain of the Lord: Temple, Praise, and Worship in the Old Testament.” It will be held on Saturday, October 26, 2013, in the Joseph Smith Building (JSB) auditorium and adjacent buildings at BYU in Provo, Utah. Admission is free, and no registration required. It is open to the general public.